After leaving Arcadia Knitting with a heavy heart and no new yarn, I had to go back down to the Convention Center to pick up my backpack before going back uptown to my sister’s place. It was getting late in the afternoon, and I was a little concerned about getting to the bag check before it closed for the day, so I took one of the three cab rides I took during my time in Chicago. I had stuffed my backpack full of ARCs picked up at the Exhibits, you see. It was much to heavy to carry all over the place. And the bag check was free. Backpack on, it was back to the Loop, then back on the El, and back to my sister’s place to change for the Newbery Banquet. And then back on the El, back to the Loop, just in time to miss the last shuttle bus. Back in the cab. I arrived a little bit after the doors opened, completely missing the (cash bar) cocktail hour. I was seated with a couple of lovely ladies from the incoming Caldecott committee (one of whom works near my in-laws in the San Gabriel Valley), and three very nice gentlemen. At the first table in my line of sight to the podium sat Elizabeth Bird, whose recap of the whole evening is a must-read. The food was interesting, but the speeches were fantastic. And after dinner was the receiving line. I was behind Elizabeth, and after a few minutes, I realized that directly behind me was Linda Sue Park. I gushed over Keeping Score a little bit. And then I had reached the first person in line. Neil Gaiman, me, and my Storm Cloud Shawlette, knit out of Tempted Handpainted Glam Grrl. Everyone was so gracious to the gazillion library-folk streaming through the line. Well, given that Neil Gaiman was at one end of the line and Ashley Bryan was at the other end, maybe “streaming” isn’t the word for it. I got to have a very nice chat with Beth Krommes about toddlers and Goodnight Moonand gushed a bit to Kathi Appelt about The Underneath. I told her that I thought of it as “stealth fantasy”. And Jacqueline Woodson complimented me on my shawlette. A fabulous evening, but a late one. I made it back to my sister’s place around midnight for another 4-hours-of-sleep night. Gaiman was going to be signing at 9 AM at the HarperCollins booth. Two CTA buses got me to the Convention Center by 7 AM. I staked out a spot near the Exhibit Hall entry closest to the booth. The bemused Security Guards told me I’d be waiting a while. I sat down on the carpet and pulled out my travelling sock. The young lady next to me arrived with her mother about 5 minutes later, and a guy arrived about 10 minutes after that. By the time the HarperCollins employees starting showing up, the line had stretched across the room and was confusing quite a few people, who thought there was now a line just to get into the Exhibit Hall. A very nice HarperCollins representative brought out the signs around 8:30. 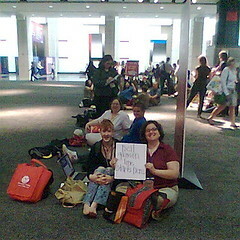 The one in my hand says, “neil gaiman line starts here”. There was another sign for the end of the line. Other than some drama with a fellow who showed up around 8:30 and wanted to jump the line because he had a meeting to run, everyone was very friendly. There was another sock knitter a few people back, and several people commented on the sock. One even took a picture and posted it to twitter. Please excuse my hair in that photo. It looks better in this one, which was also posted to twitter, but the sock is hiding. Another couple of sessions, and that was it for my ALA. I crashed at my sister’s around 6 PM and woke up at 7 the next morning, enough time to pack up, go to Joy’s for another lunch, and get to the airport almost exactly one hour before my scheduled departure. The next day, K, Little Miss, and I drove down to Sea World for a couple of days, followed by a couple of days of laundry and other chores before returning to work. There hasn’t been much knitting since we’ve been back, just a little bit of test-knitting that isn’t bloggable, and it’s going to be All Cross-Stitch All the Time around here before long. But maybe poor neglected Miss Honeychurch will finally get some quality time. OMG! 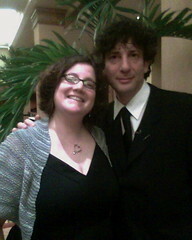 You got a picture with Neil Gaiman. I would so love to meet him. Lucky woman! !